Henry Paulson wants US to give him and his friends almost 1 trillion dollars to bail out his old company Goldman-Sachs and other friends on wall street. 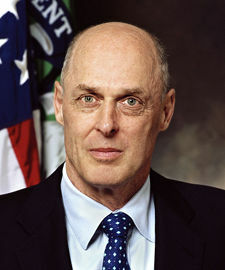 who is Henry Paulson? appointed treasury secretary by George Bush July 3, 2006. Henry Paulson does not care about the future of this country or it’s citizens. he cares about his wealth and the wealth of his friends. if you are trying to rid a field of weeds, you do not lift the irrigation headgate and flood it with water. you let it wither and die- then you burn it in the fall to get rid of the seeds. Henry Paulson and his friends are the weeds which infest our country. we need to let them wither and die. only then, can new growth occur. good bye jim foreclosure sale id #54987 Missoula Montana- a tour.